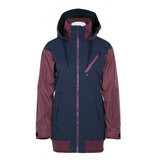 Head for the hills in the Armada Gypsum Jacket, with 10k waterproofing and breathability. If a restricting fit just isn't your jam, then the Gypsum is ideal for your ski sesh. It features Armada s Team fit, which means you'll get a whole lotta length, offering up more protection and a ton of style. Its mesh-lined pit vents mean overheating ain't no thang, and tons of pockets allow for storage of everything from your iPhone to your goggles. And as always, we encourage you to wear proper head gear; the Gypsum's hood allows for helmet wear, so you can tear it up stylishly and safely. Bundling up doesn't have to make you feel like a mummy. Get comfy in the Armada Gypsum Jacket.